Join Conference, a Microsoft Garage project, makes it easy to dial into conference calls. No more switching to the calendar app, remembering the ID/PIN codes, getting the right access number, switching to the phone app, making the call, and entering all the codes. Instead just hit one button or, even easier, join by voice command. It’s very handy for anyone that makes frequent conference calls. 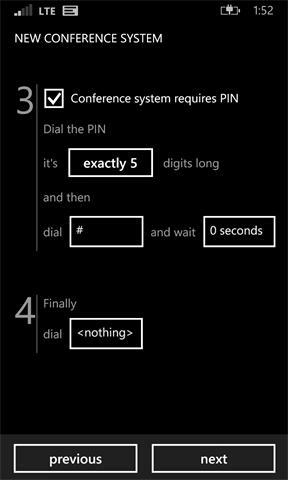 Join via voice by speaking to Cortana "JOIN MY CONFERENCE". We'll automatically figure out which meeting is going on currently or about to start, speak it back to you for confirmation, and connect you. The easiest way to connect to a meeting is having your virtual assistant do it for you! Join Conference should work with all conference systems, whatever your company might use. 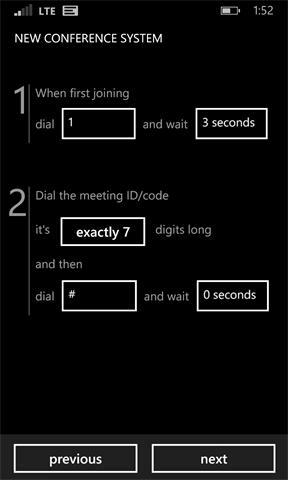 For most systems, it dials the appropriate phone number, ID, and PIN touch tones, including any special codes required when you’re the meeting leader. For Lync and GoToMeeting conferences it launches the associated app to join. Settings for many companies’ conference systems are stored on our server and recognized automatically. For those that aren't, you can define the settings yourself (then you should share them with us, to spare your coworkers the trouble). If you find a conference system that doesn’t work well with the app for some reason, please let us know. If you have issues getting a particular meeting to work, tap on the meeting in the app and pick "send feedback" off the menu, to email it to us. We'll take a look and email you back with any questions. We need that kind of real world feedback to improve the app. Microsoft Garage turns fresh ideas into real projects. Learn more at http://microsoft.com/garage.